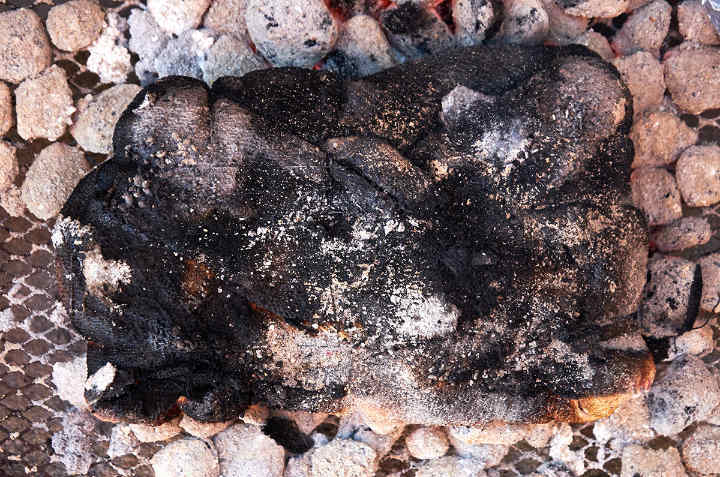 Salt encrusted sirloin cap roast grilled directly on hot coals. Sometimes the simplest dish is the best. If you love carne asada, you’ll love this dish too. 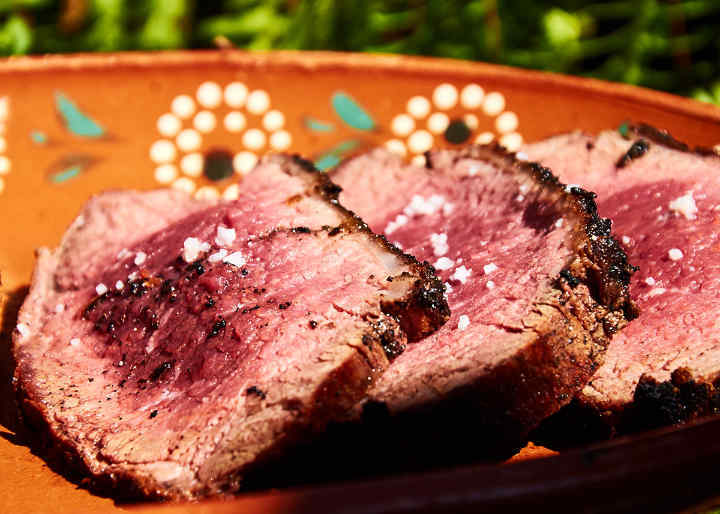 To cook, you wrap a sirloin cap roast, called picaña in Mexico, with salt soaked kitchen towels and grill it directly on hot coals. It’s real campfire cooking. 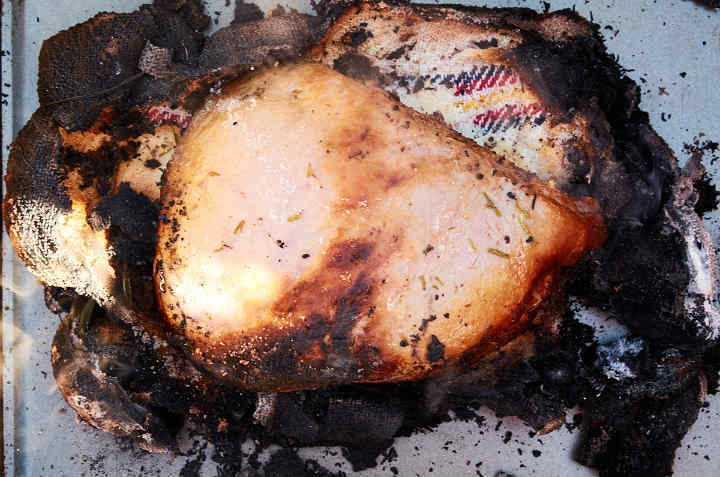 The result is a tender, smoky, slightly salty, beefy flavored piece of meat that needs nothing else but a simple charcoal grilled baked potato on the side. Wash it down with an ice cold Mexican beer for a perfect meal. 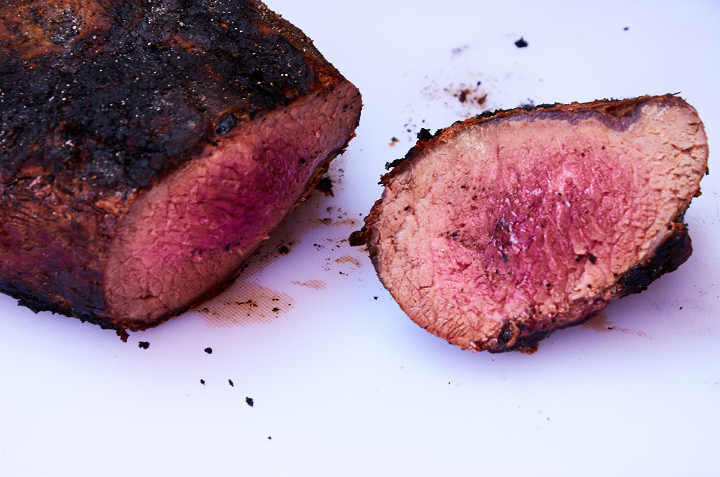 The sirloin cap is a cut that comes from just under the beef tenderloin. 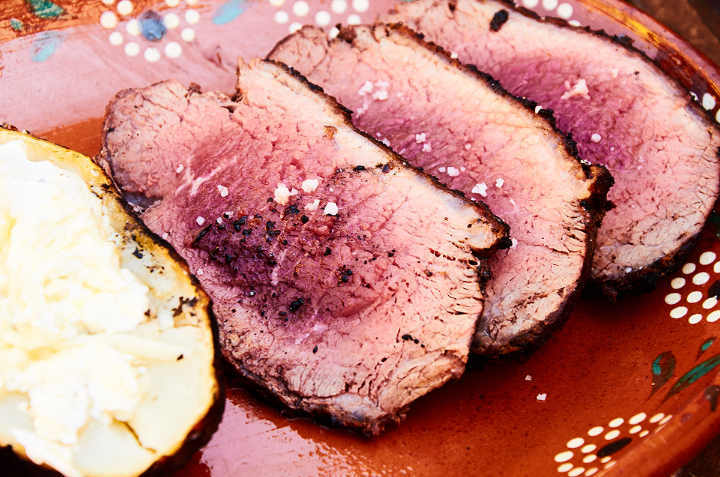 In Brazil, it’s called picanha and one of the most popular cuts used to make Brazilian BBQ. Ask for it at the butcher counter and be sure to buy it with the fat on which ensures the meat remains juicy, tender, and full of flavor. 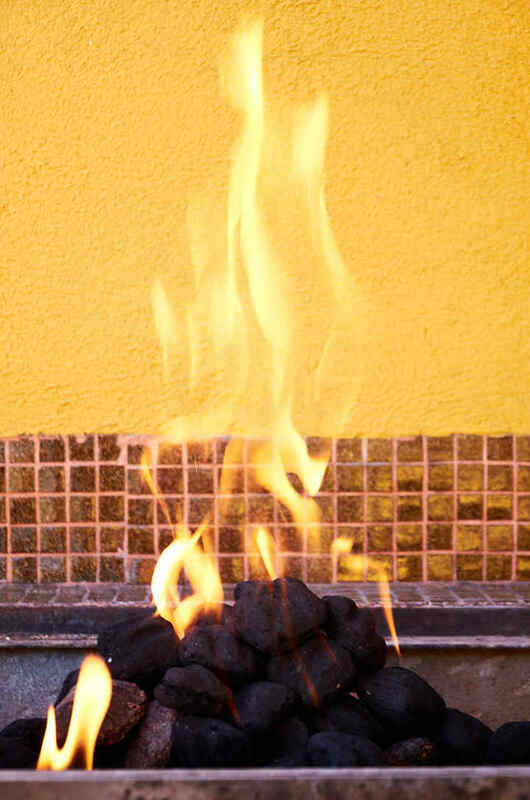 Before preparing the meat you need to start the fire to get the coals just right. 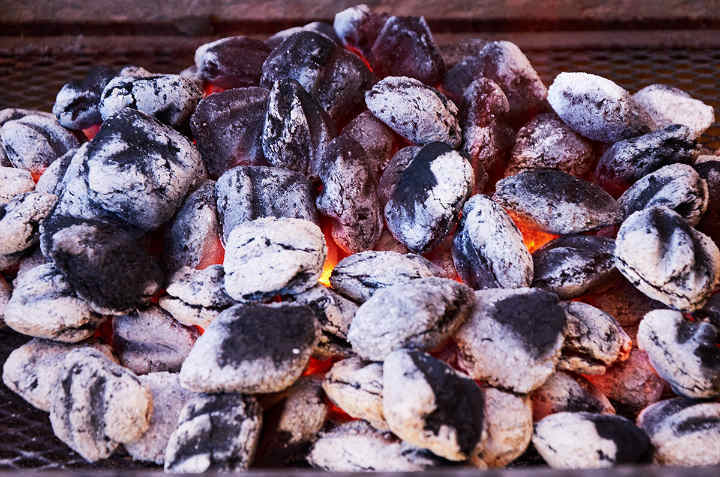 Once the flames have died down and the charcoal briquets are turning white they are ready to cook the meat. Spread them out to make a bed on which to place the meat. After you have lit the charcoal and it’s getting to just the right point start prepping the meat. 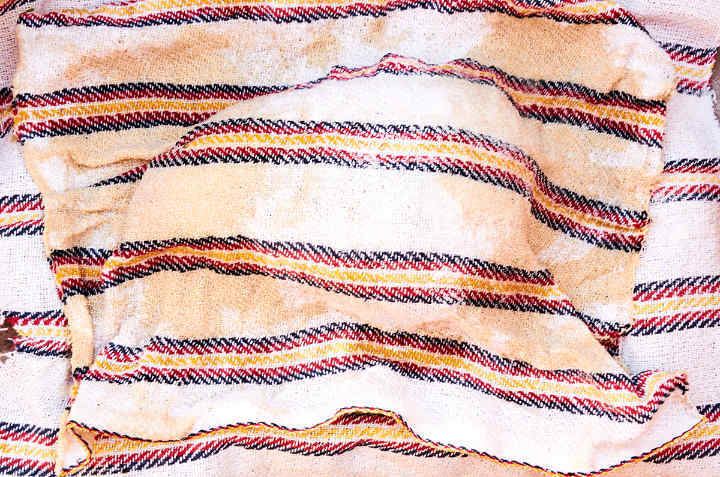 On a baking pan, spread out one of the kitchen towels and pour 1/2 of the bottle of beer in the middle of the towel. 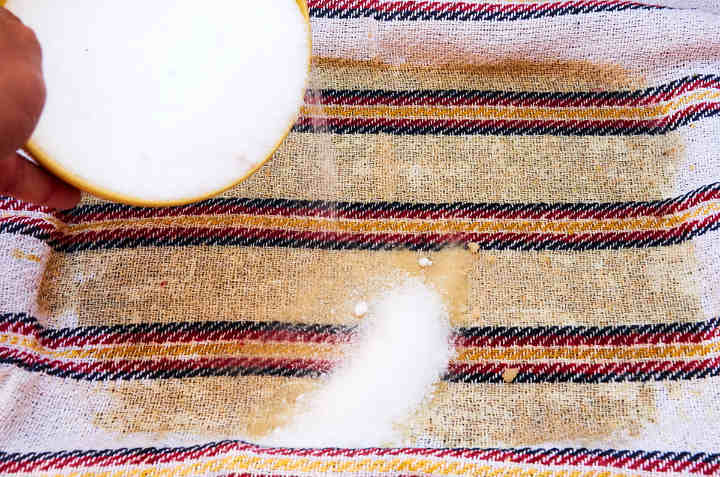 Sprinkle half of the salt evenly over the towel. A thin paste will start to form. 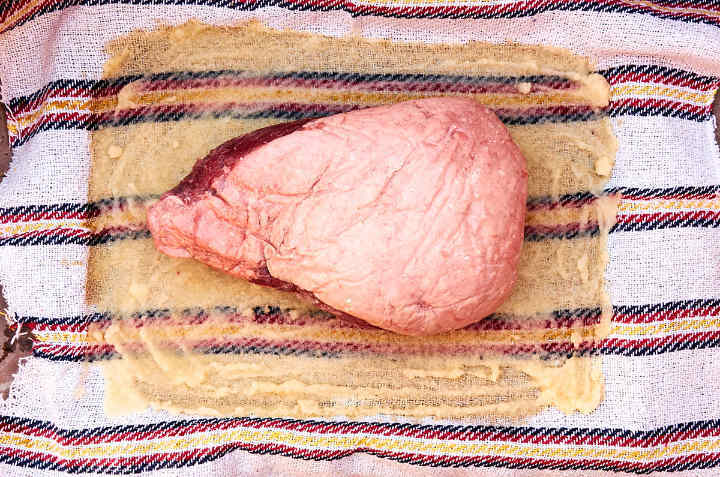 Place the sirloin cap in the middle of the towel. Top the meat with the rosemary sprigs. On the second kitchen towel pour the remaining half bottle of beer and salt. Cover the meat with the towel. Wrap the meat tightly with the kitchen towels the tie firmly. Place the wrapped meat directly on the hot coals and cook for 20 minutes. After 20 minutes, turn the meat over and cook for another 20 minutes. 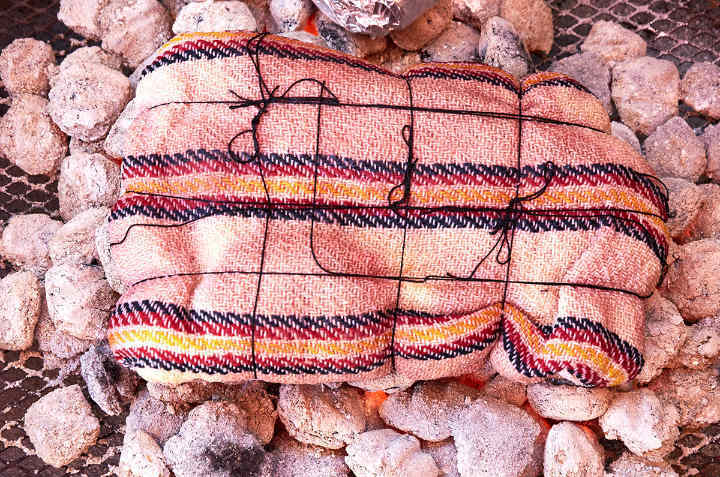 Remove the meat from the coals and let it rest for 10 minutes before unwrapping. Unwrapping the meat is very showy. Cut the meat in 1/2″ slices. 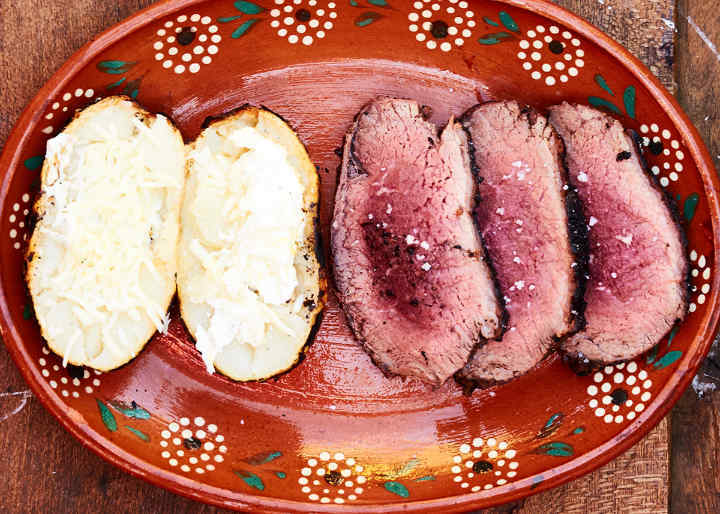 Serve 2 or 3 slices with a charcoal grilled baked potato topped with butter and shredded asadero cheese. Try it the next time you have friends and family over. They’ll love the flavor and they’ll love watching it be prepared. Cutting the meat out of the burnt towels is a unique presentation. Mexico has so many great beef dishes. This is one to add to your recipe book. You can make tacos with the meat too. Just grill up some corn tortillas and top with a great salsa like this fresh tomatillo salsa verde. 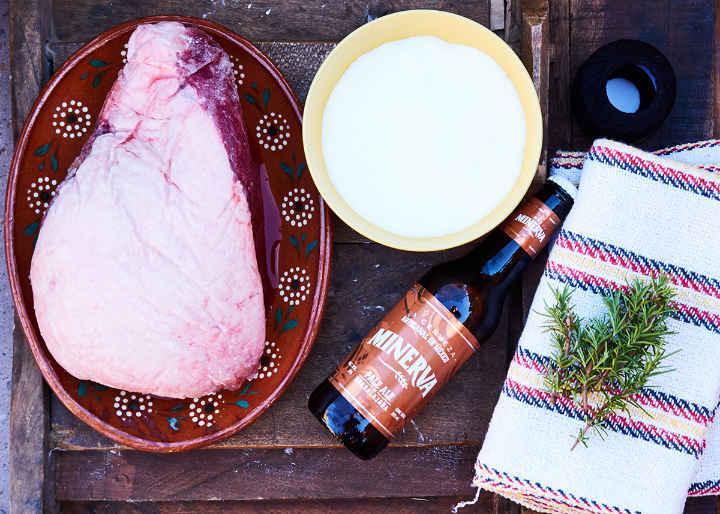 Sirloin cap roast recipe prepared by wrapping the meat with beer soaked, salt encrusted kitchen towels and then slow cooking directly on hot charcoal. Simple campfire cooking with great presentation. 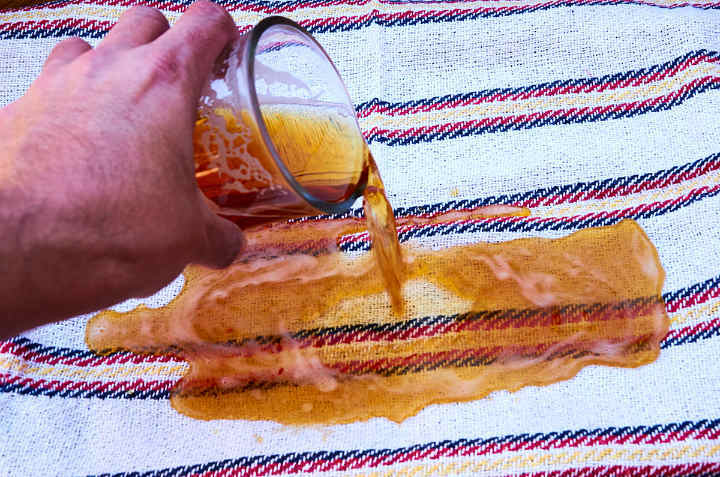 On a baking pan, spread out one of the kitchen towel and pour 1/2 of the bottle of beer in the middle of the towel. 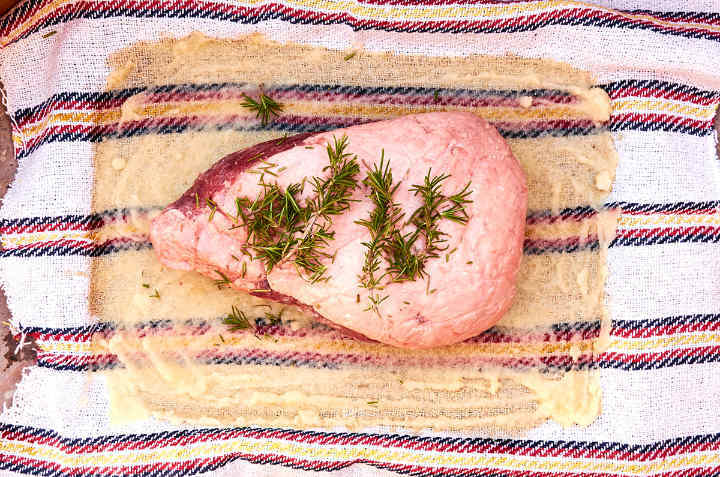 Place the sirloin cap in the middle of the towel and top with the rosemary sprigs. On the second kitchen towel pour the remaining half bottle of beer and salt. Cover the meat. 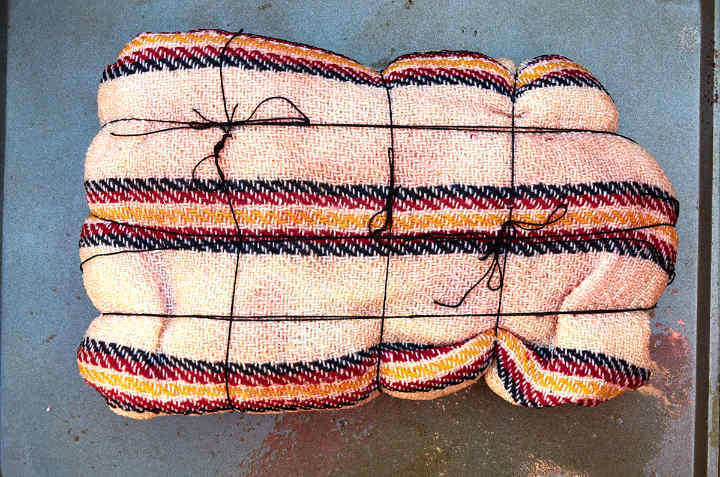 Remove the meat from the coals and let it rest for 10 minutes before unwrapping. Cut the meat in 1/2" slices. 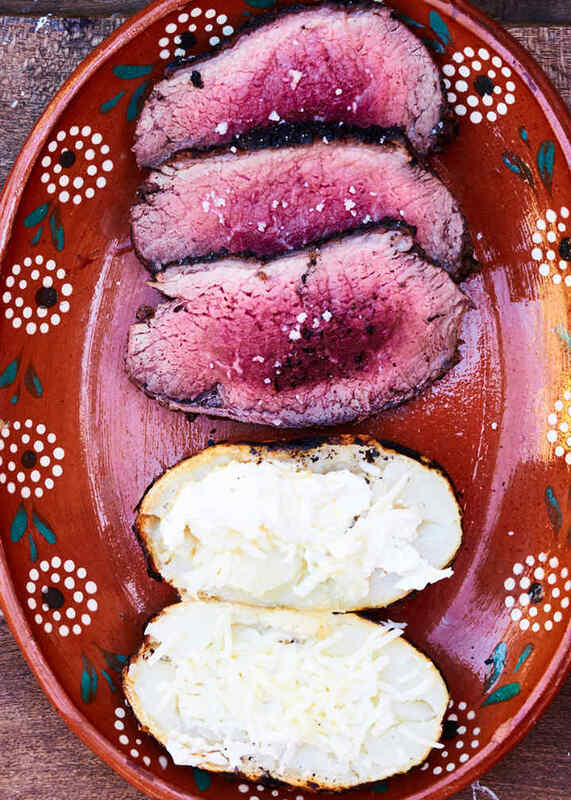 Serve with a charcoal grilled baked potato. The kitchen towels are no longer useable after cooking. Don't use your favorite ones. Buy the sirloin cap with the fat on which ensures the meat remains juicy, tender, and full of flavor. Nutritional values are estimates only.